Okay, this may be a complete fail thread, but I was wondering if anyone is interested in doing an OTG that is MUni themed. It seems quite confusing since there wouldn't be a set trick, but I think we'd be able to base skill by what the rider does. If anyone's interested, say something! That sounds perfect to me. Everyone who is participating will have to be the judge of the dificulty of the line. However, I do believe it will be somewhat difficult to judge people's vids since camera angles can alter what the line truly looks like in real life. Well for me, I ride the Nimbus Oracle 24'' w/ Bengal Disc Brakes. But, I do not use them most of the time, only when I desperately need them. I am interested but not really sure how we would keep the rides similar. Or for that matter are we even all on the same page as far as ability. One idea would be to show a Google Earth image of your ride with a list of stats about the ride. For example here is my ride today. Also if you have any photographs of the actual ride to show some sections. Just an idea. I didn't think of doing it like that. Do you know if Google Maps can locate local trails, or just main roads, bridal paths, etc.? This could be the start of something quite cool! 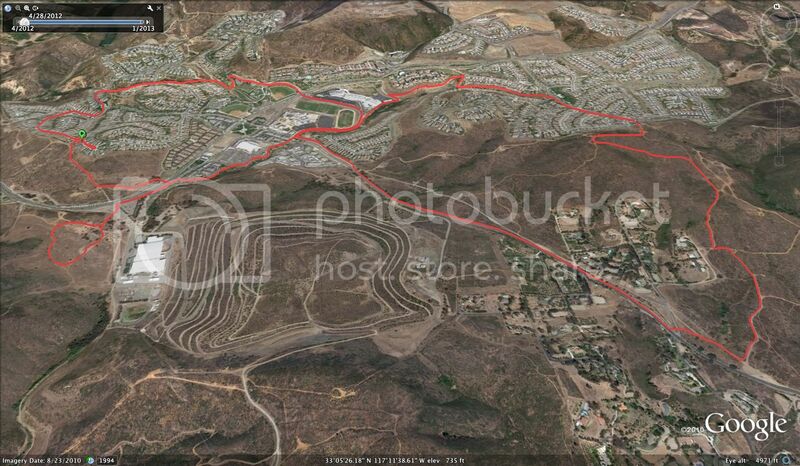 I could walk my trails using my gopro but no google maps because my trails are at my house. And possibly this to push each other. I'm in, I think it would be best if we did it in small sections, like a 30m steep climb or roll a 1m drop etc. I think your right. Let's just see how it goes. Even if it doesn't work as planned, it will still give riders motivation to make more MUni related videos! Sounds good! How long till we start? A couple of ways to do this. Using a simple handheld GPS you can upload to a free program called Garmin Basecamp. Once you upload your ride to Basecamp you simple click on it(you might have more then one depending on the length of the ride) and go up to the menu at the top that says view. From here scroll down to view selected data in Google Earth. It will then bring up your gps track log in Google Earth. Once there you can view/zoom in and then save a copy of the photograph. Upload this image to a photo storage site(Photobucket) and then post to Unicyclist.com. An alternative way is if you have a smart phone you can down load a free app. called Strava. This app uses your phone to triangulate your position using cell towers. I really like the simplicity of the application but have had poor luck on getting an accurate elevation. For some reason Strava always over inflates my elevation. I am posting this information more for the question above an not necessarily for this game. want to start this week? If so ill start!